Curtain roulette - right to the back? Just had a 'seat change for operational reasons' email which was interesting as it is still a long way off - the flight is not until December. We knew it was a gamble picking a row near the front but I am not sure why they moved us so far back! 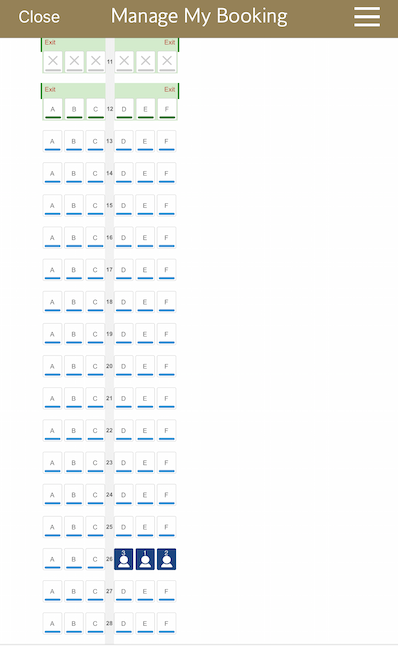 Maybe hoping some pax will pay for seats further forward? When you first selected seats, was the curtain still in front of row 11. I had occasions where my seat was changed by the system because of the curtain place change. Be aware that the exit row is also empty. Presumably you are now back in 12C? On some services you would be well placed for a speedy exit (e.g. GLA and NCL). I seen this too, generally if you leave it untouched overnight it may well put you further forward. But as the NEOs work their way through the fleet I wouldn't get too attached to any seat number just yet. I’ve had similar today as well, moved to row 15 with CE now expanded to row 12 despite not a single seat showing as taken in CE per ExpertFlyer. This is for a flight in Jan 2020. But why put us in row 26 with an empty cabin? Just change your seat selection back up to a row you prefer? BA’s seating algorithm works in strange and mysterious ways. Look on the bright side, at least they kept you sat all together Very bizarre. Well - no! I would, but my travelling companions like to have their bags with them, so exits and bulkheads are generally out. Yes, not too 'attached' to any particular seat - just seemed a bizarre move in an empty cabin. And that's a good point about the rear exit if deplaning speed was the priority. The trip is to VIE - we've been before but I can't remember whether it is airbridge or bus, although I am not that bothered. Anyway, we are with a non-status pal, so anywhere forward is a rare treat for her - and a bit of T3 breakfast! endoman and george77300 like this. I get this happen too. My theory was just that they don’t want to keep moving the same people back multiple times. So someone lazily wrote a rule that says if you get curtained you move right to the back, rather than keep edging them back, as they don’t know how far the curtain will move. You can assume front door 1L airbridge only in VIE. Yes I'd say that's right. It's been at least a couple of years since I've experienced anything other than this on the VIE rotations.